DGFC has been working closely with the Chief Judge of Sabah and Sarawak, Tan Sri Richard Malanjum in order to raise awareness about environmental issues, in particular wildlife trafficking, illegal hunting and logging. 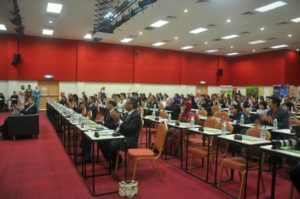 DGFC’s director became part of a supporting committee set up by the High Court in Sabah and Sarawak with the goal of establishing an Environmental Court. He presented the keynote address at the first seminar on environmental issues organised by the High Court.